The Anatomy of a Nonfiction Book Launch 2 Recently updated ! 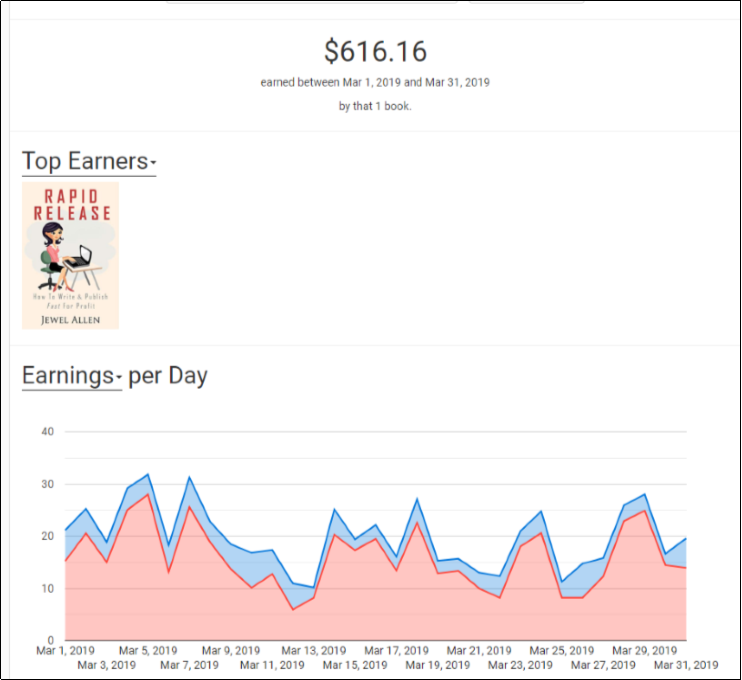 As I have been curious myself about how my nonfiction experience has gone since publishing Rapid Release on January 19, 2019, I decided to study my stats and share my observations in a blog post. A little bit about the genesis of this book. There were four main reasons why I wrote it. First, I had data from five months of rapid releasing a clean billionaire romance series—an average of 50k words per book per month, religiously on pre-orders from August 24 (my birthday) through December 24, 2018, and I thought, why not share it? Second, whenever I would go on author forums, some people asked about rapid release. Respondents would direct them to write-ups about it online, but none in a book. I hoped to fill a need. Third, I wanted to produce a how-to book that I wished I could have had when I started rapid releasing. Fourth, I’d already been blogging about my experience, so putting it all together in a book was an easy next step. 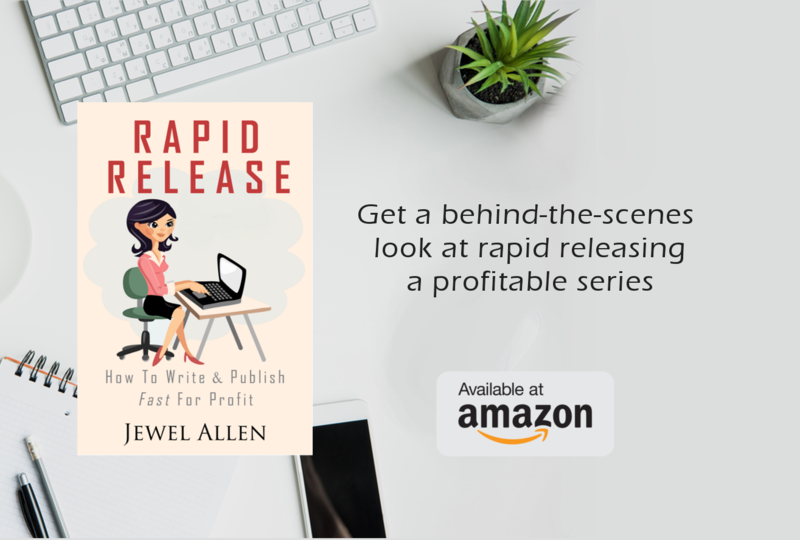 When it was all said and done, Rapid Release came in at 20k words or 101 e-pages. I also have guest commentary from other authors successfully rapid releasing that I believe has given readers even more value. Okay, so with that little background out of the way, let’s look at publishing stats. Note that the only paid advertising I did was a $20 Facebook ad I ran for four days ($5 per day) in February. I launched Rapid Release in the wee hours of January 19. It was a Sunday so I didn’t promote it actively. I’ve noticed that, like me, most people prefer to keep the Sabbath Day commercial-free. Now to address the question of this book bucking the trend of nonfiction being sold “wide” on multiple platforms such as Amazon, Barnes & Noble, etc., and instead, I had decided to sell it exclusively on KU. If you will look at most writing how-to books especially ones written by indie superstars, they are sold wide and very few are on KU. Prices fluctuate anywhere from 4.99 to 9.99. If I had a more established name in non-fiction (or fiction for that matter), I would have considered switching to $4.99. Some, like mine, are priced at $2.99. A few that have stayed sticky (ranking high) are priced at .99, perhaps as a loss leader to funnel readers to the rest of their series. Initially, I priced Rapid Release at 99 cents and not in KU. Two days later, I enrolled it in KU. Here was my thought process on why I did the latter. I figured people might give an unknown nonfiction author like me a chance in KU. I also thought about my behavior as a consumer. I love it when I can read a nonfiction writing how-to title in KU, cheapskate that I am, but I don’t have guilt because at least I am still giving an author page-reads. On Jan. 21, I enrolled the book in KU. Sales and page reads spiked that day. For 11 days, I made $117.83, selling 229 units and getting 8,366 page reads (equivalent to 82 units). Blue is KU and pink is sales. 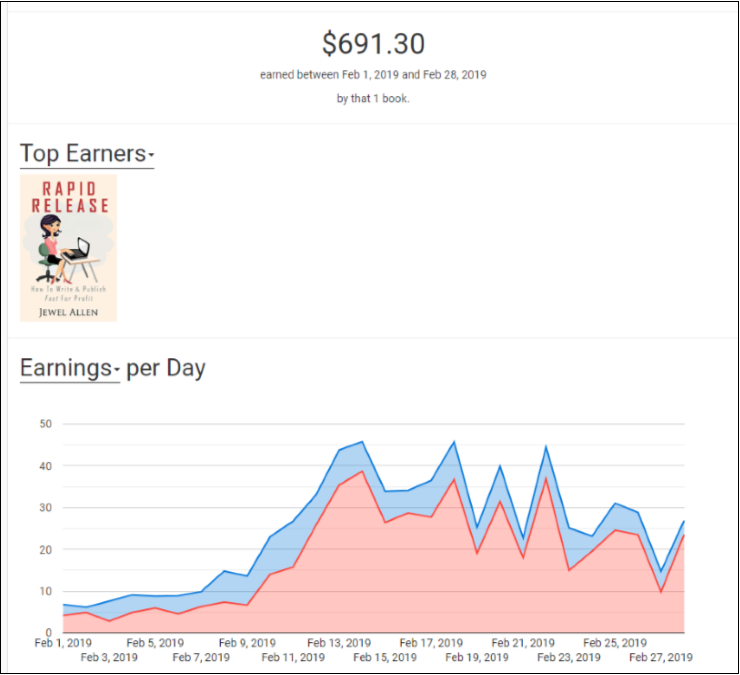 In February, I made $691.30, sold 503, and got 36,577 page reads (equivalent to 362 units). Midway through the month (more about this below the graphic) I bumped the price up to $2.99. Note the spike on Feb. 13. That was when I broke into the Amazon Author rank Top 100 in Business & Investing. 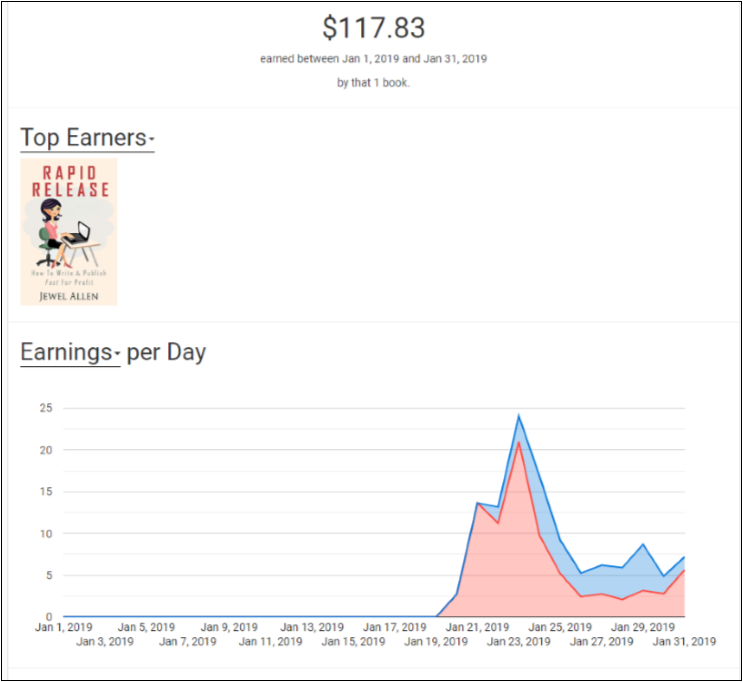 What I did: I ran a $5/day Facebook ad four days that week, shared it in my newsletter and another nonfiction author’s, and on social media. For a book that was an in-betweener to my fiction, I was pleasantly surprised for it to be doing so well with hardly any paid advertising. The following day, Feb. 14, I changed the price to $2.99. I immediately lost my Amazon Author rank, but it was fun while it lasted. As you will see, the book still kept going strong despite the higher price. I decided to keep it there for the time being. On February 21, Brian Meeks released his book Mastering Amazon Descriptions. Rapid Release appeared in its also boughts ( other books his buyers have bought), which gave my book a little boost. In March, I made $616.16, sold 263 copies and had 26,437 page reads (261 units). Incidentally, I got a little spike at the end of the month. On March 28, UK-based The Guardian mentioned me and Rapid Release in an interesting article. The bulk of the article talked about plagiarism and its rise from the pressures of releasing fast. 1.Just like with fiction, if you have more than one nonfiction book idea in you, capitalize on the interest by having others in the pipeline. Rapid Release makes up half my monthly income right now; it would have been nice to have other titles ready. 2.Pricing at 99 cents coupled with Facebook advertising can launch your nonfiction book into bestseller status and give you an author rank. I want to try Facebook advertising once again and see what that does. My observation as I have poked around is there is less competition in nonfiction as there is in fiction so getting that bestseller tag is easier. 3.Switching to a higher price point did not lose me readers and gave me more income. I loved the higher rank, but my actual royalties were smaller at 99 cents. I might try a different nonfiction title at 99 cents for longer next time to test my theory. Some readers have also commented that after they read my book in KU, they went on to buy my book at $2.99 and even recommend it for others to purchase. So I got paid both ways. I could probably increase the price and still make sales, but I know how strapped for cash authors like myself are. $2.99 for a short nonfiction how-to seemed fair while still helping out those who may benefit from my book. 4.Publishing nonfiction related to your fiction could help sales of the latter. I am seeing a carry-over in reads to my clean billionaire romance series because of Rapid Release. 5.Reviews on nonfiction could be more brutal than on fiction. Or at least I tend to take them a bit more personally. For the most part, my book has gotten 5 and 4 star reviews. And then there are a few super-harsh ones. Not surprisingly, by writing about my experience and having the chutzpah as a small fish in a big pond, I was opening myself up to criticism. However, my negative nonfiction reviews were harsher than I have seen with my fiction. I love the good reviews while the bad ones leave me down and very insecure as a writer for a day or two. So my solution has been to stop reading reviews for now. Writing nonfiction / memoir is not for the faint-hearted. 6. That said, the positive feedback has been heart-warming and humbling. Am I glad I published Rapid Release despite the occasional low-blow negative review…definitely! I’m grateful I could help others. One of the things I never expected from publishing this book is getting messages from fellow authors who had been intimidated by self-publishing or had been ready to give up, thanking me for writing Rapid Release and telling me I’d given them hope. Thank you for reading! Check out Rapid Release here. Subscribe to my newsletter here. Awesome post, full of juicy data!